The hill from which the town of Pilot Mound, in the Municipality of Louise, takes its name is a bedrock ridge streamlined by glacial action. Archaelogical excavations in 1908 showed an artificial mound on top of the hill to have been a burial place for late prehistoric Indians. Within recorded time, the hill was a gathering place for buffalo hunters and for Indians who held ceremonial dances there and named it “Little Dance Hill.” A local legend recorded by settlers about 1878 states that, sometime between 1851 and 1855, the Sioux were defeated by Red River buffalo hunters in a skirmish near the hill. 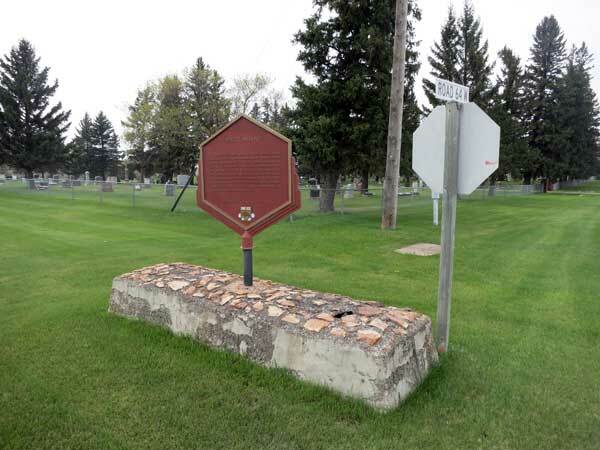 A commemorative plaque for the mound was erected near the Pilot Mound Cemetery by the Historic Sites Advisory Board of Manitoba. “The Dakota-Metis Battle of Mepawaquomoshin, circa 1851” by Lawrence Barkwell, Scribd. This page was prepared by Ed Grassick and Gordon Goldsborough.